Oxford Interactive Media in collaboration with Oxford Brookes and Oxford and Cherwell Valley College Developing and teaching IT courses including Computers and Internet for Beginner's, digital photography, desktop publishing, web design and flash animation for all people of Northway, Headington, Marston and Barton. Northway IT Centre monitor and supervise all learners with an aim to equip them with computing skills to help them to use computers for their leisure or to start using computers in their business or creative design. and older people in Oxford city to work together in learning activities and to allow younger and older to learn from each other. Oxford Interactive Media is expecting to expand the services in the coming months. 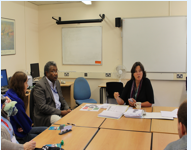 These activities are managed by Ahmed Rahman, Age UK Community IT Development Officer and Northway’s IT manager. In today's world almost all businesses use computers. So the demands for specialist skills are extremely high - and growing all the time. From using everyday E-mail, Microsoft Office software to desktop support, computer networking, programming and computer maintenance, it's a rich and varied sector. Whichever area you're interested in, we offer a range of IT and computing courses that will give you the skills you need. Learn everything from how to use a computer confidently, to upgrading it and even programming. 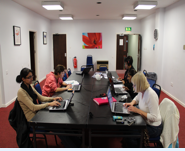 Our Microsoft Office course also includes the latest software. Our range of Digital Media courses cover every aspect of digital design and application. Whether you're interested in DTP design, authoring multimedia projects, animation, digital Imaging, or web application design, our courses provide a fantastic way to enter the exciting and rewarding world of digital design. OXFORD INTERACTIVE MEDIA Dora Carr Close, Headington, Oxford. Tel: 01865 764273 Mobile: 07786387025 Copyright © 2000 All rights reserved. Northway Community Association Dora Carr Close, Headington, Oxford. Tel: 01865 764273 Copyright © 2009 All rights reserved.